Can your shtender do this? We’re often asked why we don’t sell our metal-base shtender for less. People often comment that other shtenders with metal bases cost much less. They tell us that they see them listed online for half what we charge. They are correct. Other sthenders do cost less – and there’s a good reason. They’re simply not made as well as ours and won’t hold up to daily use. 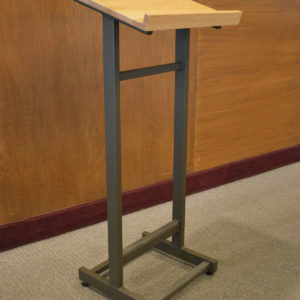 Our metal-base shtender is made with a solid wood top. No plywood, no particle board, no press-board, and no fake laminated veneer. The wood has a simple beauty and grain that will last for decades. The base on our shtender is made from heavy-gauge welded steel. The finish is a baked-on powder coat which is durable and washable. Our shtender is designed to withstand daily use by a bunch of 15-years yeshiva bochers. Apparently they can be a little rough on furniture. A teacher in New York contacted us to say that he was tired of replacing his shtender every few months. It seems that he was buying one of the less-expensive imported shtenders, and after just a few months of use by his students it was bent, broken, and beyond use. We designed this shtender so well to be sure it would be the last one he needed to buy. We purposely used an easy-to-clean finish, and we purposely didn’t include any moving or adjustable parts. Nothing to lose, nothing to break, and nothing to distract. Simply an elegant and strong shtender designed to fulfill its mission daily. All of our shtenders are made in the USA using the highest quality materials we can find. They may not be the cheapest shtenders on the market, but we believe they are the best.